Let's suppose you and I get jobs digging holes. Let's suppose we get to keep our jobs based on how well we dig relative to each other. It should be simple to determine who digs more: all our boss has to do is measure how far down our holes go. It turns out I'm much better at digging than you are: my holes are deeper, I dig more of them, and you can't keep up. The boss, after threatening you with dismissal, sends you over to my job site so you can get professional development on hole digging. That's where you learn that, while you've been using a hand shovel, I've been using a 10-ton backhoe. And while you've been digging into bedrock, I've been digging into soft clay. You go back to the boss and complain about two things: first, it's wrong for you and me to be compared when the circumstances of our jobs are so different. Second, why is the boss wasting your time having me train you when there's nothing I can teach you about how to do your job? The boss has an answer: he is using a statistical method that "fully takes into account" the differences in our jobs. He claims there's no bias against you because you're using a shovel and digging into rock. But you point out that your fellow shovelers consistently get lower ratings than the workers like me manning backhoes. The boss argues back that this just proves the shovelers are worse workers than the backhoe operators. Which is why you need to "learn" from me, because "all workers can dig holes." Everyone see where I'm going with this? 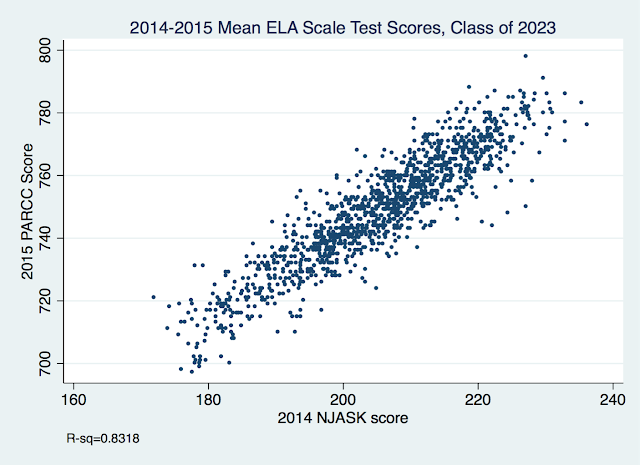 A student's prior test scores will predict their future performance: if a student got low test scores in Grades 3 through 5, he will probably get a low score in Grade 6. If we gather together all the students with similar test score histories and compare their scores on the latest test, we'll see that those scores vary: a few will do significantly better than the group, a few will do worse, and most will be clustered together in the middle. 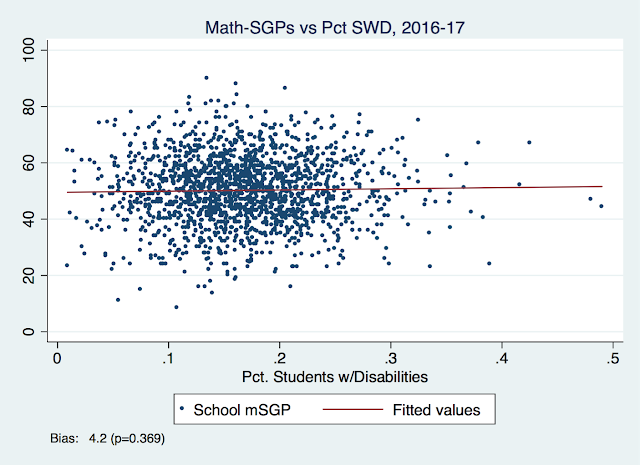 We can rank and order these students' scores and assign them a place within the distribution; this is, essentially, an SGP. But we can go a step further: we can compare the SGPs from one group of students with the SGPs from another. 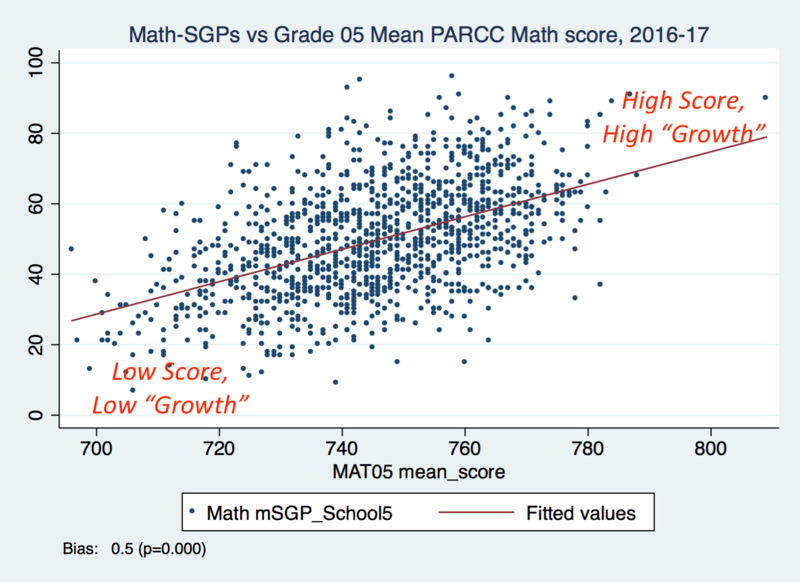 In other words: a student with an SGP of 50 (SGPs go from 1 to 99) might be in the middle of a group of previously high-scoring students, or she might be in the middle of a group of previously low scoring students. Simply looking at her SGP will not tell us which group she was placed into. To make an analogy to my little story above: you and I might each have an SGP of 50. But there's no way to tell, solely based on that, whether we are digging into clay or bedrock. And there's no way to tell from a students' SGP whether they score high, low, or in the middle on standardized tests. The father of SGPs is Damian Betebenner, a widely-respected psychometrician. Betebenner has written several papers on SGPs; they are highly technical and well beyond the understanding of practicing teachers or education policymakers (not being a psychometrician, I'll admit I have had to work hard to gain an understanding of the issues involved). This statement alone is reason enough why New Jersey should not compel employment decisions on the basis of SGPs: You can't fire a teacher for cause on the basis of a measure its inventor says does not show cause. It's also important to note that SGPs are relative measures. "Growth" as measured by an SGP is not an absolute measure; it's measured in relationship to other, similar students. All students could be "growing," but an SGP, by definition, will always show some students growing below average. One of the issues Betebenner admits is a problem with using SGPs in teacher evaluation is a highly technical issue known as measurement endogeneity; he outlines this problem in a paper he coauthored in 2015(2) -- well after New Jersey adopted SGPs as its official "growth" measure. 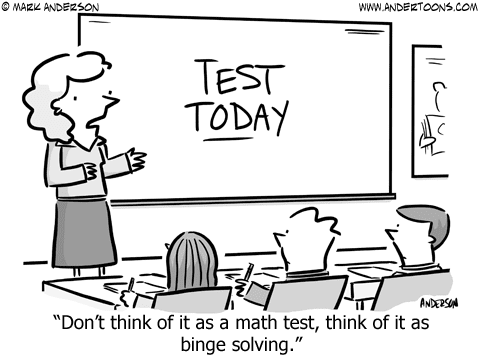 The problem occurs because test scores are error-prone measures. This is just another way of saying something we all know: test scores change based on things other than what we want to measure. If a kid gets a lower test score than he is capable of because he didn't have a good night's sleep, or because he's hungry, or because the room is too cold, or because he gets nervous when he's tested, or because some of the test items were written using jargon he doesn't understand, his score is not going to be an accurate representation of his actual ability. It's a well-known statistical precept that variables measured with error tend to bias positive estimates in a regression model downward, thanks to something called attenuation bias. (3) Plain English translation: Because test scores are prone to error, the SGPs of higher-scoring students tend to be higher, and the SGPs of lower-scoring students tend to be lower. Again, this means we've got a problem at the student level with SGPs: they tend to be larger than they should be for high-scoring students, and lower than they should be for low-scoring students. Let me also point out that Betebenner and his colleagues are the ones who, unprompted, bring up the issue of "fairness." Let's show how this plays out with New Jersey data. I don't have student-level SGPs, but I do have school-level ones, which should be fine for our purposes. 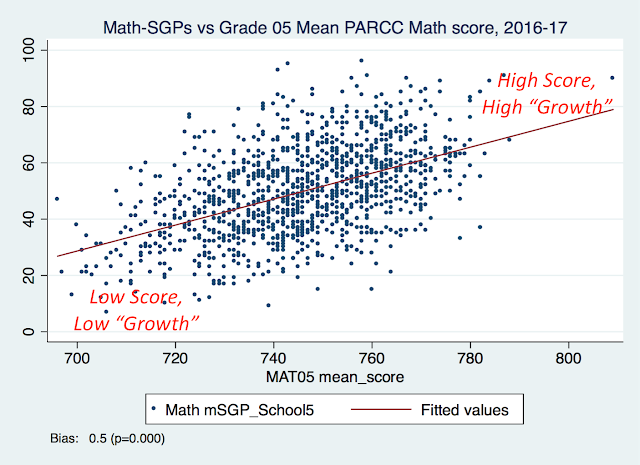 If SGPs are biased, we would expect to see high-scoring schools show higher "growth," and low-scoring schools show lower "growth." Is that the case? New Jersey school-level SGPs are biased exactly the way its inventor predicts they would be -- "which raises serious fairness concerns." I can't overemphasize how important this is. 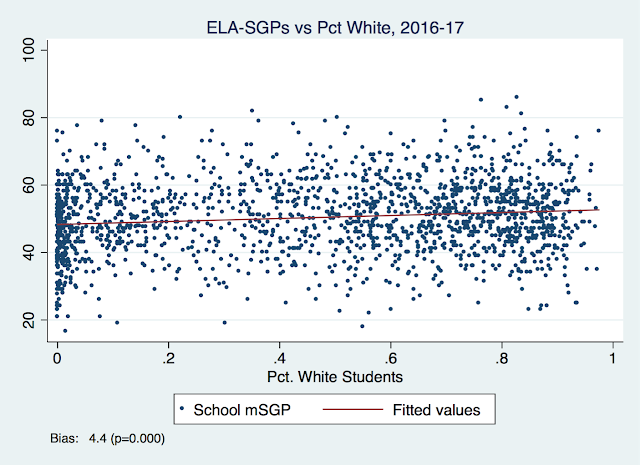 New Jersey's "growth" measures are biased against lower-scoring students, not because their "growth" is low, but likely because of inherent statistical properties of SGPs that make them biased. Which means they are almost certainly going to be biased against the teachers and schools that enroll lower-scoring students. Shang et al. propose a way to deal with some of this bias; it's highly complex and there are tradeoffs. But we don't know if this method has been applied to New Jersey SGPs in this or any other year (I've looked around the NJDOE website for any indication of this, but have come up empty). In addition: according to Betebenner himself, there's another problem when we look at the SGPs for a group of students in a classroom and attribute it to a teacher. You see, New Jersey and other states have proposed using SGPs as a way to evaluate teachers. In its latest federal waiver application, New Jersey stated it would use median SGPs (mSGPs) as a way to assess teacher effectiveness. This means the state looks at all the scores in a classroom, picks the score of the student who is right in the middle of the distribution of those scores, and attributes it to the teacher. The problem is that students and teachers are NOT randomly assigned to classrooms or schools. So a teacher might pay a price for teaching students with a history of getting lower test scores. Betebenner et al. freely admit that their proposed correction -- and again, we don't even know if it's currently being implemented -- can't entirely get rid of this bias. 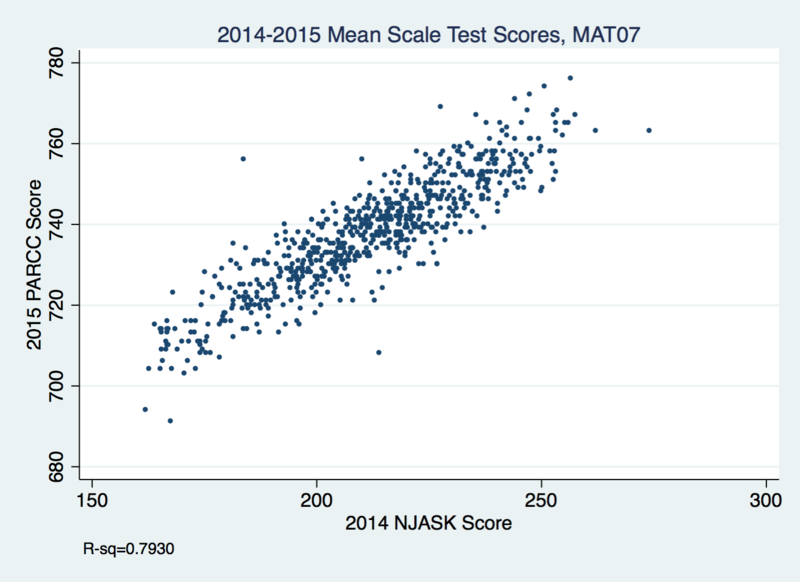 As we all know, there is a clear correlation between test scores and student economic status. 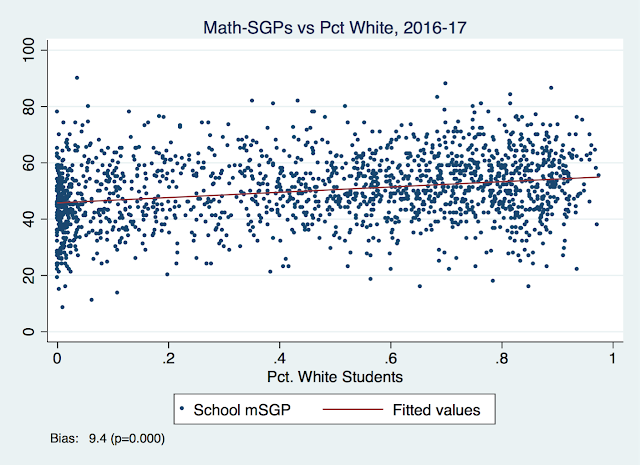 Which brings us to our ultimate problem with SGPs: Are teachers who teach more students in poverty unfairly penalized when SGPs are used to evaluate educator effectiveness? I don't have the individual teacher data to answer this question. I do, however, have school-level data, which is more than adequate to at least address the question initially. 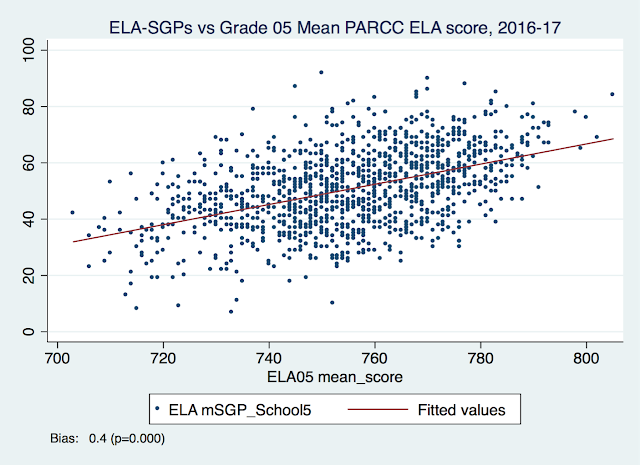 What we want to know is whether SGPs are correlated with student characteristics. If they are, there is plenty of reason to believe these measures are biased and, therefore, unfair. 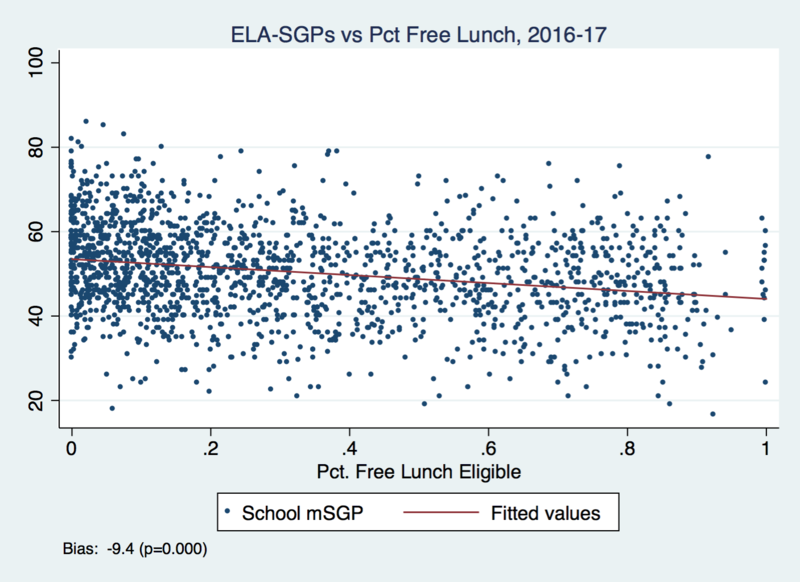 So let's look at last year's school-level SGPs and see how they compare to the percentage of free lunch-eligible students in the school, a proxy measure for student economic disadvantage. The technique I'm using, by the way, follows Bruce Baker's work year after year, so it's not like anything I show below is going to be a surprise. 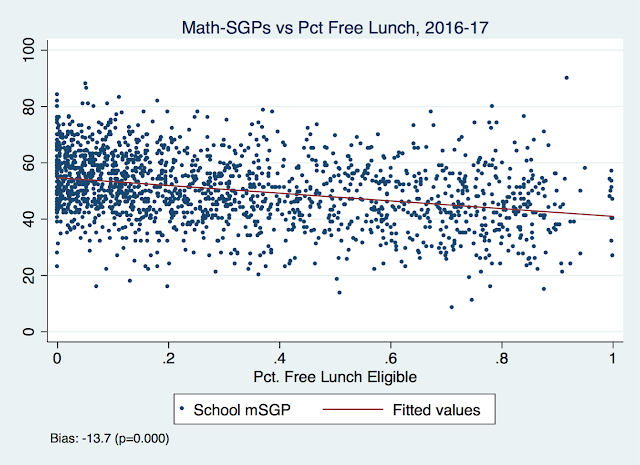 SGPs in math are on the vertical or y-axis; percentage free lunch (FL%) is on the horizontal or x-axis. There is obviously a lot of variation, but the general trend is that as FL% rises, SGPs drop. On average, a school that has no free lunch students will have a math SGP almost 14 points higher than a school where all students qualify for free lunch. The correlation is highly statistically significant as shown in the p-value for the regression estimate. 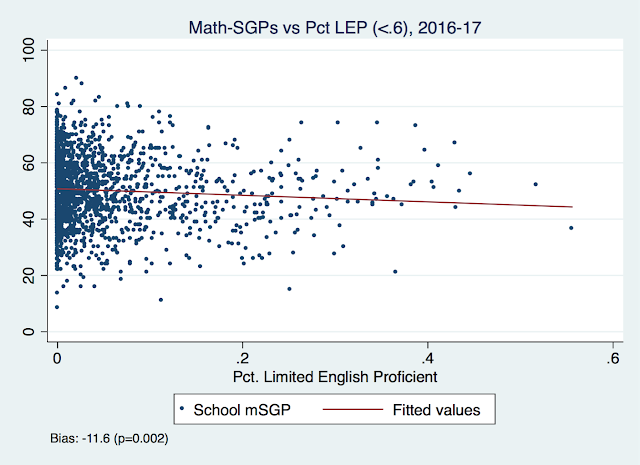 Again: we know that, because of measurement error, SGPs are biased against low-scoring students/schools. We know that students in schools with higher levels of economic disadvantage tend have lower scores. We don't know if any attempt has been made to correct for this bias in New Jersey's SGPs. 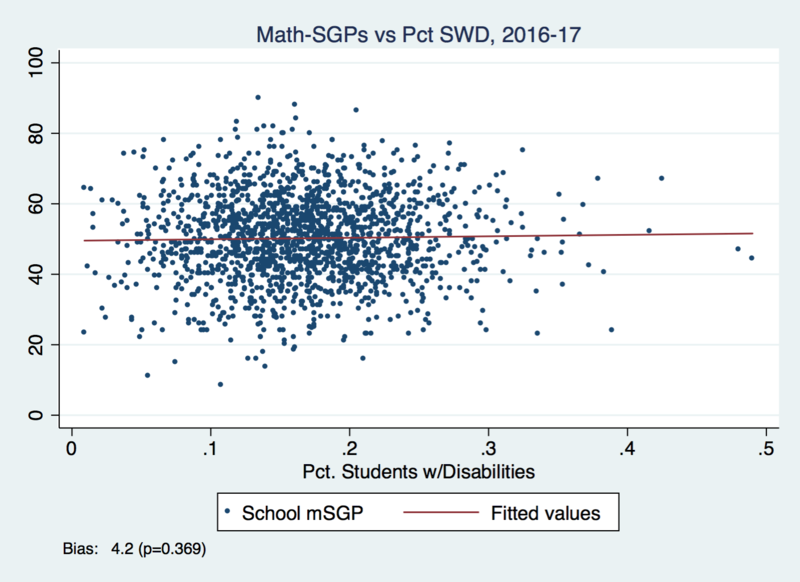 There is more than enough evidence to suggest that SGPs are biased and, therefore, unfair to teachers who educate students who are disadvantaged. Below, I've got some more graphs that show biases based on English language arts (ELA) SGPs, and correlations with other student population characteristics. I don't see how anyone who cares about education in New Jersey -- or any other state using SGPs -- can allow this state of affairs to continue. Despite the assurances of previous NJDOE officials, there is more than enough reason for all stakeholders to doubt the validity of SGPs as measures of teacher effectiveness. The best thing the Murphy administration and the Legislature could do right now is to tightly cap the weighting of SGPs in teacher evaluations. This issue must be studied further; we can't force school districts to make personnel decisions on the basis of measures that raise "...serious fairness concerns..."
Minimizing the use of SGPs is the only appropriate action the state can take at this time. I can only hope the Legislature, the State BOE, and the Murphy administration listen. Years ago, a snarky teacher-blogger warned New Jersey that test-based teacher evaluation was a disaster waiting to happen. 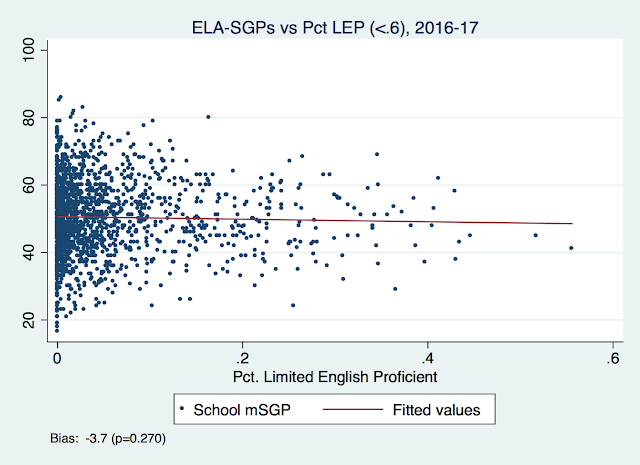 Here's the correlation between ELA-SGPs and FL%. 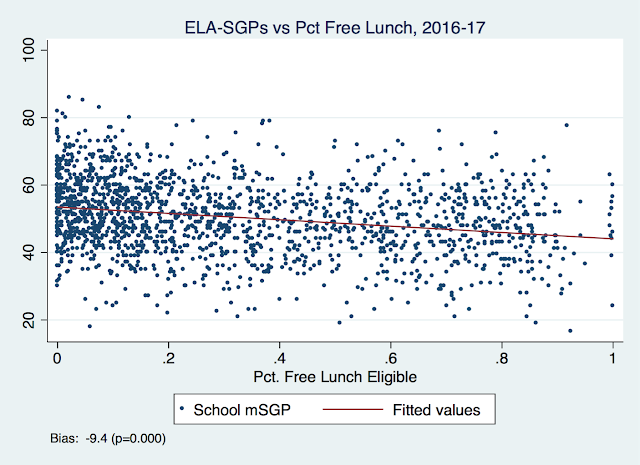 A school with all FL students will, on average, see a drop of more than 9 points on its SGP compared to a school with no FL students. Here are correlations between SGPs and the percentage of Limited English Proficient (LEP) students. I took out a handful of influential outliers that were likely the result of data error. 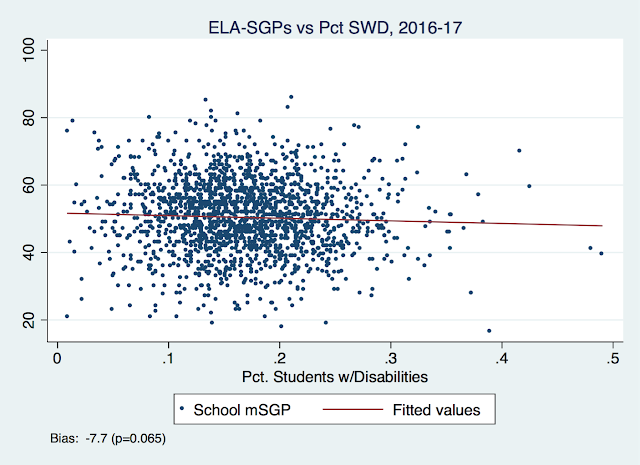 The ELA SGP bias is not statistically significant; the math SGP bias is. There are also positive correlations between SGPs and the percentage of white students. 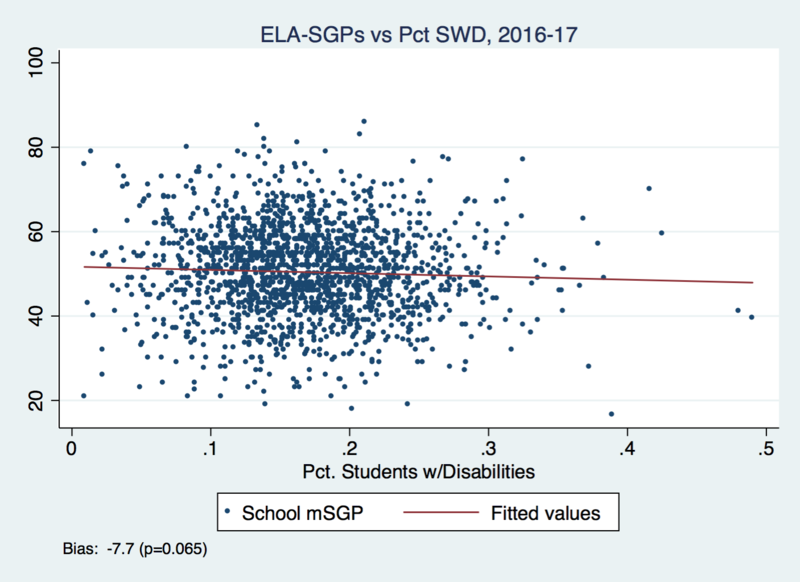 Here are correlations between students with disabilities (SWD) percentage and SGPs. Neither is statistically significant at the traditional level. 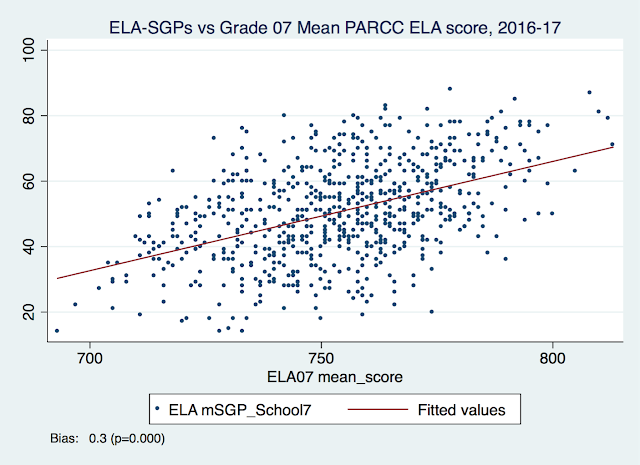 Finally, here are the correlations between some grade-level SGPs and grade-level test scores. I already showed Grade 5 math above; here's Grade 5 ELA. And correlations for Grade 7. 3) Wooldridge, J. (2010). Econometric Analysis of Cross Section and Panel Data (Second Edition). Cambridge, MA: The MIT Press. p. 81. I'll tell you what I've been up to soon, I promise. I'm actually still in the middle of it... but I've been reading and hearing a lot of stuff about education policy lately, and I've decided I can't just sit back -- even if my time is really at a premium these days -- and let some of it pass. Gov. Phil Murphy just announced that he will start phasing out the PARCC test, our state's most powerful diagnostic tool for student achievement. Like an MRI scan, it can detect hidden problems, pinpointing a child's weaknesses, and identifying where a particular teacher's strategy isn't working. This made it both invaluable, and a political lighting rod. New Jersey Gov. 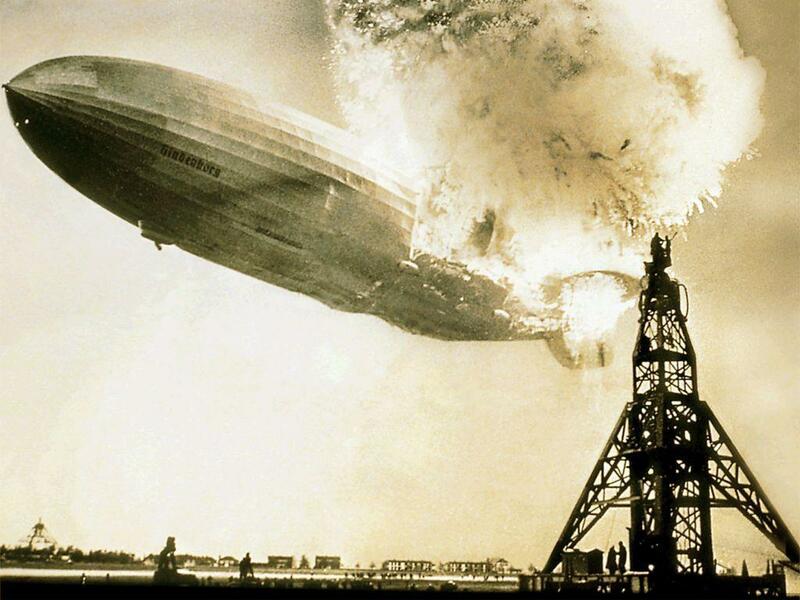 Phil Murphy is already making good on his promises to the teachers unions. Too bad it’s at the kids’ expense. Officially, he wants the state to transition to a new testing system — one that’s less “high stakes and high stress.” It’s a safe bet that the future won’t hold anything like the PARCC exams, which are written by a multi-state consortium. Instead, they’ll be Jersey-only tests — far easier to water down into meaninglessness. The sickest thing about this: A couple of years down the line, Murphy will be boasting about improved high-school graduation rates — without mentioning the fact that his “reforms” have made many of those diplomas worthless. First of all -- and as I have pointed out in great detail -- it's the Chris Christie-appointed former superintendents of Camden and Newark, two districts under state control, who have done the most bragging about improved graduation rates. These "improvements" have taken place under PARCC; however, it's likely they are being driven by things like credit recovery programs, which have nothing to do with high school testing. The Post wants us to believe that the worth of a high school diploma is somehow enhanced by implementing high school testing above and beyond what is required by federal law. But there's no evidence that's true. In 2016-17, only 12 states required students to pass a test to graduate; the only other state requiring passing the PARCC is New Mexico. Further, as Stan Karp at ELC has pointed out, the PARCC passing rate on the Grade 10 English Language Test in 2017 was 46%; the passing rate on the Algebra I exam was 42%. That's three years after the test was first introduced into New Jersey. Does the Post really want to withhold diplomas from more than half of New Jersey's students? The PARCC was never designed to be a graduation exit exam. The proficiency rates -- which I'll talk about more below -- were explicitly set up to measure college readiness. It's no surprise that around 40 percent of students cleared the proficiency bar for the PARCC, and around 40 percent of adults in New Jersey have a bachelors degree. I don't know when we decided everyone should go to a four-year college. If we really believe that, we'll have a lot of over-educated people doing necessary work, and we'll have to more than double the number of college seats available. Anyone think that's a good idea? NY Post, should New Jersey jack up taxes by an insane amount to open up its state colleges to more than twice as many students as they have now? Let's move on to the S-L's editorial. The idea that the PARCC is somehow the "most powerful diagnostic tool" for identifying an individual child's weaknesses, and therefore the flaws in an individual teacher's practice, is simply wrong. 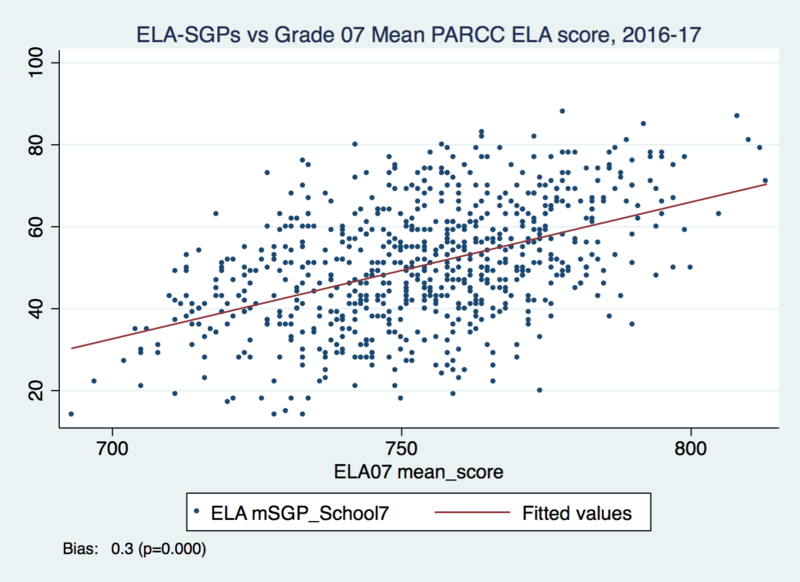 The most obvious reason why the PARCC is not used for diagnosing individual students' learning progress is that by the time the school gets the score back, the student has already moved on to the next grade and another teacher. There are, in fact, many other assessment tools available to teachers -- including plenty of tests that are not designed by the student's teacher -- that can give actionable feedback on a student's learning progress. This is the day-to-day business of teaching, taught to those of us in the field at the very beginning of our training: set objectives, instruct, assess, adjust objectives and/or instruction, assess, etc. The PARCC, like any statewide test, might have some information useful to school staff as a child moves from grade-to-grade. But the notion that it is "invaluable" for its MRI-like qualities is just not accurate. How do I know? That purpose is accountability. That's something I, and every other professional educator I know, is all for -- provided the tests are used correctly. As I've written before, I am generally agnostic about the PARCC. From what I saw, the NJASK didn't seem to be a particularly great test... but I'll be the first to admit I am not a test designer, nor a content specialist in math or English language arts. The sample questions I've seen from the PARCC look to me to be subject to something called construct-irrelevant variance, a fancy way of saying test scores can vary based on stuff you're trying not to measure. If a kid can't answer a math question because the question uses vocabulary the kid doesn't know, that question isn't a good assessor of the kid's mathematical ability; the scores on that item are going to vary based on something other than the things we really want to measure. If this were truly for the sake of over-tested students, we wouldn't be starting with the PARCC. Unlike its predecessors, this test can tell educators exactly where kids struggle and how to better tailor their lessons. It's crucial for helping to close the achievement gap between black and white students; not just between cities and suburbs, but within racially mixed districts. Again: the PARCC is a lousy tool for informing instruction, because that's not its job. 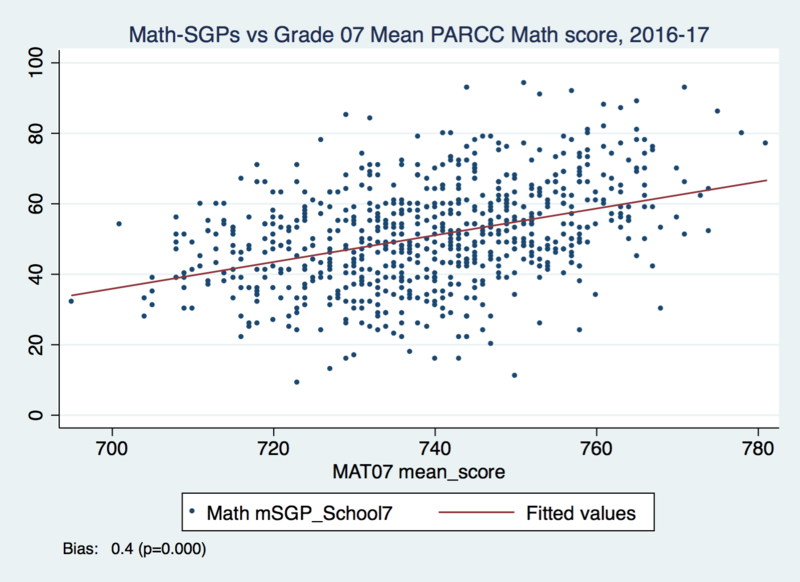 The PARCC is an accountability measure -- and as such, there is very little reason to believe it is markedly better at identifying schools or teachers in need of remediation than any other standardized test. Think about it this way: if the PARCC was really that much better than the NJASK, we'd expect the two tests to yield very different results. A school that was "lying" to its parents about its scores on the NJASK would instead show how it was struggling on the PARCC. There would be little correlation between the two tests if one was so much better than the other, right? These are the Grade 7 English Language Arts (ELA) test scores on the 2014 NJASK and 2015 PARCC, the year it was first used in New Jersey. Each dot is a school around the state. 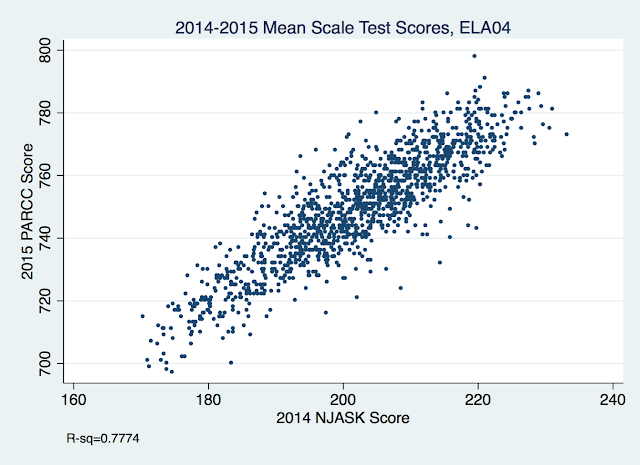 Look at the strong relationship: if a school has a low score on the NJASK in 2014, it had a low score on the PARCC in 2015. 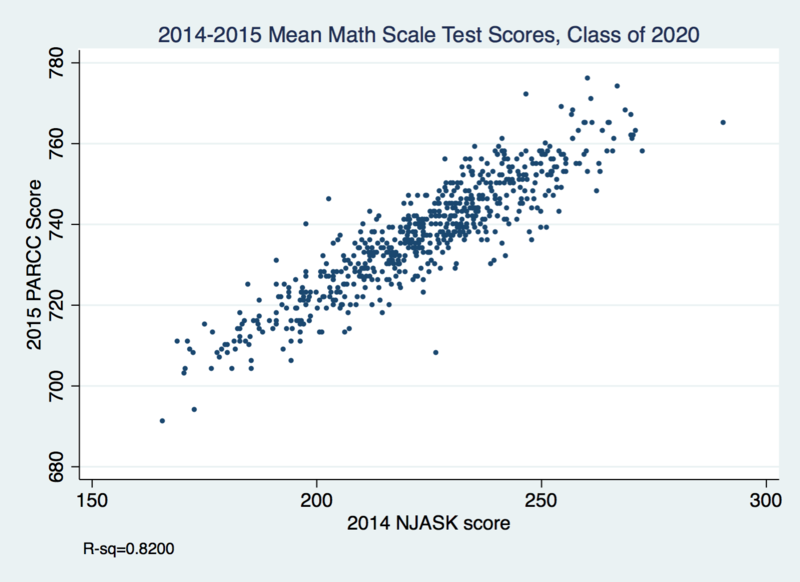 Similarly, if it was high in 2014 on the NJASK, it was high on the 2015 PARCC. 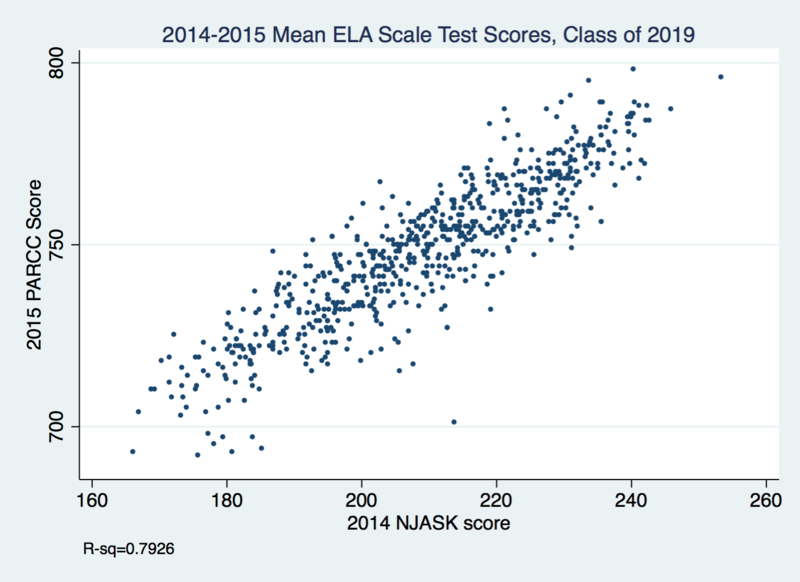 80 percent of the variation on the PARCC can be explained by last year's score on the NJASK; that is a very strong relationship. 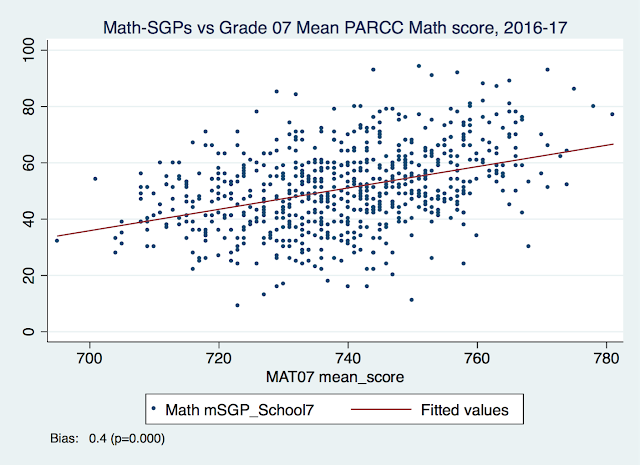 I'll put some more of these below, but let me point out one more thing: the students who took the Grade 7 NJASK in 2014 were not the same students who took the Grade 7 PARCC in 2015, because most students moved up a grade. 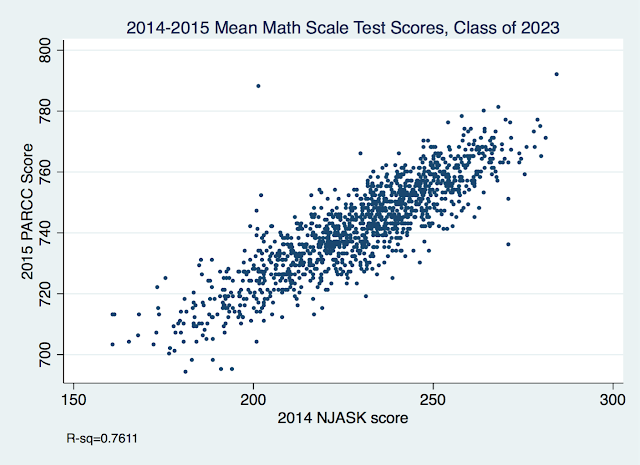 How did the test scores of the same cohort compare when they moved from Grade 7, when they took the NJASK, to Grade 8, when they took the PARCC? Still an extremely strong relationship. No one who knows anything about testing is going to be surprised by this. 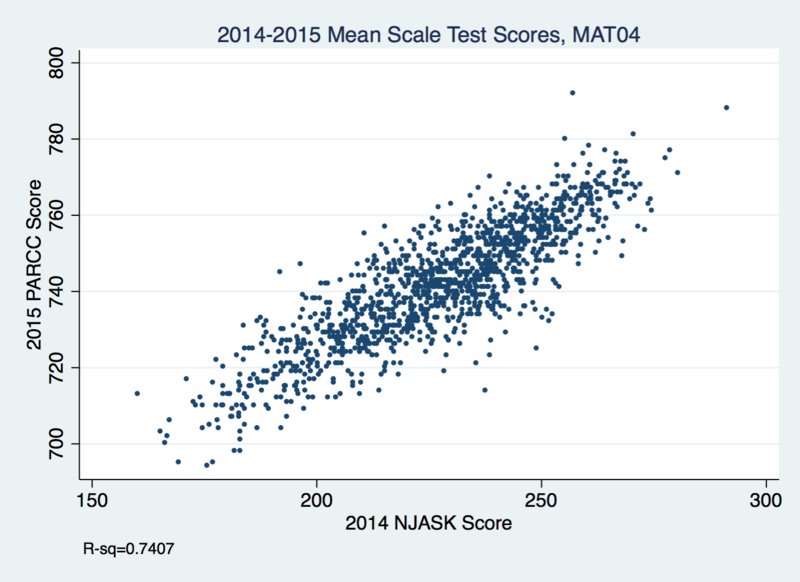 Standardized tests, by design, yield normal, bell-curve distributions of scores: a few kids score low, a few score high, and most score in the middle. There's just no evidence to think the NJASK was "lying" back then any more than the PARCC "lies" now. Again, I've been over this more than a few times: "proficiency" rates are largely arbitrary. When you have a normal distribution of scores, you can set the rate pretty much wherever you want, depending on how you define "proficient." I know that makes some of you crazy, but it's true: there is no absolute definition of "proficient," any more than there's an absolute definition of "smart." So, no, the NJASK wasn't "lying" about NJ students' proficiency; the state could have used the same distribution of scores from the older test* and set a different proficiency level. And no, the PARCC is not in any way important as a diagnostic tool, nor is there any evidence it is a much "better" test than the old NJASK. Look, I know this bothers some of you, but I am for accountability testing. The S-L is correct in noting that these tests have played an important role in pointing out inequities within the education system. I am part of a team that works on these issues, and we've relied on standardized tests to show that there are serious problems with our nation's current school funding system. But if that's the true purpose of these tests -- and it's clear that it is -- then we don't need to spend as much time or money on testing as we do now. If we choose to use test outcomes appropriately, we can cut back on testing and remove some of the corrupting pressures they can impose on the system. ADDING: This is not the first time I've written about the PARCC fetishism. ADDING MORE: Does it strike any of you as odd that both the NY Post and the Star-Ledger came out with similar editorials beating up Governor Murphy and the teachers unions over his new PARCC policy -- on the very same day? As I've documented here: when it comes to education (and many other topics), editorial writers often rely on the professional "reformers" in their Rolodexes to feed them ideas. If there is a structural advantage these "reformers" have over folks like me, it's that they get paid to make the time to influence op-ed writers and other policy influencers. They are subsidized, usually by very wealthy interests, to cultivate relationships with the media, which in turn bends the media toward their point of view. a) What if my child is doing well in the classroom and on his or her report card, but it is not reflected in the test score? PARCC is only one of several measures that illustrate a child’s progress in math and ELA. Report card grades can include multiple sources of information like participation, work habits, group projects, homework, etc., that are not reflected in the PARCC score, so there may be a discrepancy. Report cards can also reflect outcomes on tests made by teachers, districts, or other vendors, administered multiple times. The PARCC, like any test, is subject to noise and bias. It is quite possible a report card grade is the better measure of an individual student's learning than a PARCC score. If there is a disconnect between the PARCC and a report card, OK, parents and teachers and administrators should look into that. But I take the above statement from NJDOE as an acknowledgment that the PARCC, or any other test, is a sample of learning at a particular time, and it's outcomes are subject to error and bias like any other assessment. Again: by all means, let's have accountability testing. But PARCC fetishism in the service of teachers union bashing is totally unwarranted. Stop the madness. SCATTERPLOT FUN! Here are some other correlations between NJASK and PARCC scores at the school level. You'll see the same pattern in all grades and both exams (ELA and math) with the exception of Grade 8 math. Why? Because the PARCC introduced the Algebra 1 exam; Grade 8 students who take algebra take that exam, while those who don't take algebra take the Grade 8 Math exam. * OK, I need to make this clear: there was an issue with the NJASK having a bit of a ceiling effect. I've always found it kind of funny when people got overly worried about this: like the worst thing for the state was that so many kids were finding the old test so easy, too many were getting perfect scores! Whether the PARCC broke through the ceiling with construct-relevant variance is an open question. My guess is a lot of the "higher-level" items are really measuring something aside from mathematical ability. 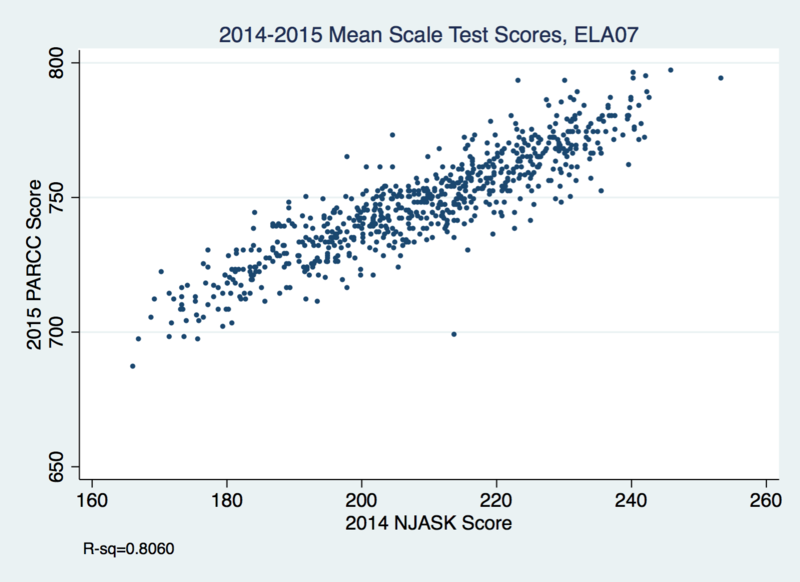 In any case, the NJASK wasn't "lying" just because more kids aced it than the PARCC.